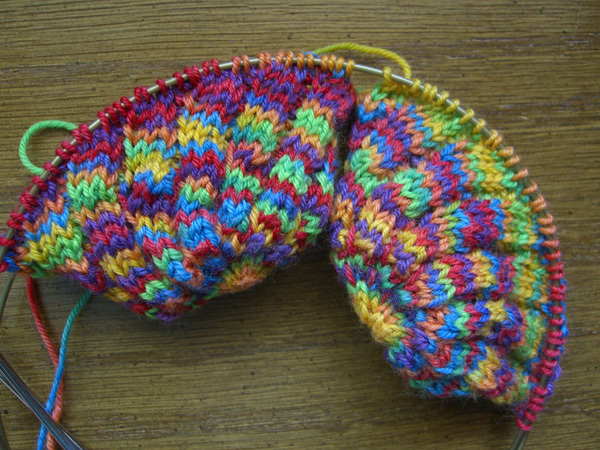 As promised, here’s a picture of the start of the Mermaid socks, which I am, of course, knitting toe-up. This is Lorna’s Laces Shepherd Sock in colorway Rainbow. My question to all of you out there… is it too bright? Are these going to end up looking like clown socks? Do I care? Will these be the socks that I grab for on bleak, dark Northwest winter mornings? Or will I be blinded by the brightness and hide them in the back of the sock drawer? I don’t want to keep knitting something that I’m not going to end up liking. It might be just this pattern. But I’m not sure that another pattern would look less bright. The Mermaid pattern comes from Lucy Neatby’s Cool Socks Warm Feet, which appears to be out of print. If you can find a copy, get it! It has some great patterns in it. This is the second time I’ve knit Mermaid socks. The first pair I attempted were meant to be a gift, but I ended up frogging them out when the gauge turned out to be wrong. Dare I hope that I’ll finish this pair?